Thanksgiving is coming up fast. What festive fare will your kids be watching on the big day? Sure, you can keep them occupied when they wake up because the Macy's Thanksgiving Day Parade will take up a good chunk of the morning. But what about after the parade wraps? How will you keep your youngsters occupied while you finish cooking and getting the house prepped for the arrival of the rest of the family? We've rounded up some fun Thanksgiving-themed movies and TV specials that you can turn on whenever you want. Keep reading to see our kid-friendly picks. How could we not include this classic TV special? 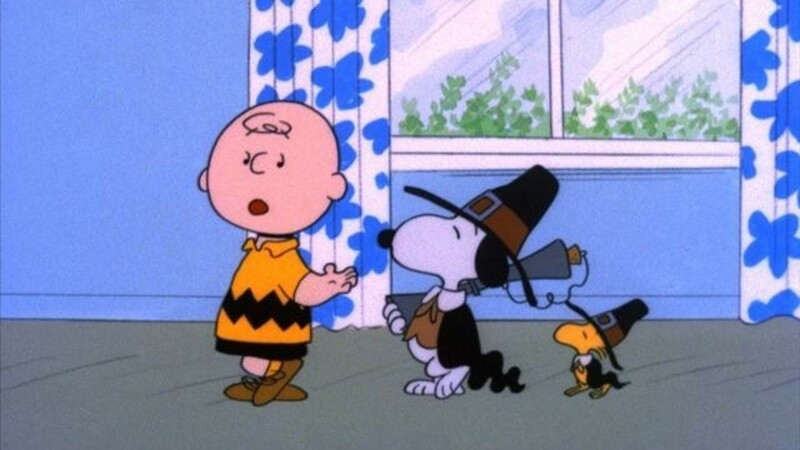 A Charlie Brown Thanksgiving is the best place to start if you're looking for kid-friendly fare. Watch it on YouTube (it's broken up into parts, but it's all free!). Destined to be a new favorite Thanksgiving movie, 2013's Free Birds stars Owen Wilson and Woody Harrelson voicing two turkeys who are looking to avoid ending up on someone's Thanksgiving dinner table by any means necessary. You can watch Free Birds on Amazon Prime Video. Technically, Miracle on 34th Street could be thrown into the Thanksgiving movie mix because it begins during a fictional version of the Macy's Thanksgiving Day Parade and continues through the rest of the holidays. If your kids are beyond excited for the whole holiday season, why not kick things off with a viewing of this classic? You can rent Miracle on 34th Street on Amazon Prime Video. Holiday Inn is a delightful classic musical that will no doubt have your kids singing and dancing along right from the opening credits. Starring Bing Crosby and Fred Astaire, Holiday Inn follows two performers competing for the affections of another (played by Marjorie Reynolds) as all three work as an inn that's only open on holidays (like Thanksgiving! ), and it features holiday-themed musical numbers. Rent Holiday Inn on Amazon Prime Video. Introduce your kids to the most iconic cat in cartoon history: Garfield. The Garfield Thanksgiving special is now available on YouTube. Alvin and the Chipmunks never fail to entertain, so why not fire up their 1994 Thanksgiving special (for free!) on YouTube when you need a second to rest after spending all day cooking and wrangling the kids? If you have younger kids, definitely consider renting Winnie the Pooh: Seasons of Giving on YouTube Movies. The sweet special features a series of montages focused on Winnie the Pooh and his friends celebrating different holidays, including (you guessed it) Thanksgiving. Beloved director John Hughes' final film, Curly Sue, is an unconventional pick for a Thanksgiving kids movie, but it's also a ton of fun and it's officially old enough to be considered a classic. Why not give it a try? The film follows two grifters (played by Jim Belushi and Alisan Porter) who try to con a well-to-do woman (played by Kelly Lynch). It loosely takes place around Thanksgiving and features an unconventional family dynamic and characters looking for a place to call home. Rent Curly Sue on Amazon Prime Video. 9. Steven Universe, "Gem Harvest"
From season four, the Steven Universe episode "Gem Harvest" puts a unique spin on Thanksgiving, with beloved protagonist Steven Universe visiting two very special Gems, Lapis and Peridot, and meeting a strange new character during his annual autumn visit. The episode is quick and easy to find (part one is above and part two is here), and it will undoubtedly keep your kids occupied as you're doing last-minute Thanksgiving prep.